It’s been a long cold winter here in Rhode Island. And it doesn’t seem to be letting up. Snow is on the forecast for tomorrow and next week. This is about the time I’m so ready for spring to come. (Oh wait! It’s here!) We’ve had a few sunny days that have fueled the eagerness even more. But I know it’s New England, and I know to expect another month or so of winter. Since it’s been cold and dark early (up until last week), we’ve spent our evenings curled up in front of the TV together. After giving up our cable, we signed up for Hulu Plus, and I must say that I love it! I can watch almost any show I want. I caught up on the current season of Glee through early mornings on the treadmill. Now I’ve started in on Smash. Jeremy’s been watching The Vikings when he has some free time, and we’ve even gone back to Season 1 of Arrested Development. The coolest thing, though, is that we got the kids hooked on The Amazing Race. We started watching the very first season – before it started winning Emmy’s year after year. What a difference! The show is much more documentary-like, which is pretty darn cool. Mason and Cooper have become addicted and want to watch it every chance they get. They have their favorite teams and know them all by name. It’s such a fun show to watch together – we get to see all different areas of the world, see relationships fail or blossom, and enjoy a good ol’ fashioned race. Jeremy and I are excited to watch more seasons with the kids and remind ourselves of some of the great teams and great seasons. The Voice is another one of our favorites that we will be tuning into starting next week. Honestly, we’re all excited to see Xtina gone and are very curious to see how Shakira and Usher do in the red chairs. Of course Jeremy and I have our usuals – Modern Family, Parks and Rec, Community, New Girl, Parenthood, Ben and Kate, The Office, Biggest Loser, etc. On the sad side, though, I missed the last 2 episodes of Top Chef, and there are no Bravo shows on Hulu Plus. That’s a major bummer for me. But I’m getting through it, and we’re certainly keeping ourselves entertained. We bought our beloved first home in Silver Spring back at the height of the 2004 market. We got lucky. Several of our friends had looked for months and had lost out on many homes due to bidding wars. While we did look for months, when we finally found a house we loved, we put in our first offer and got it. It had very little curb appeal, but the bones were there. Between Jeremy being an architect and amazing space planner and me being… well… hmm… (I guess it’s time I let the cat out of the bag. Jeremy is the designer. We chose things for that house together, but he had the vision much more than I did.) Over the years WE made that house our home, and it was wonderful. Now we’re looking to do it all over again. It is very exciting to me because it’s a chance to change things up. My design aesthetics have changed over the years, and I’m eager to design help Jeremy design our new house. First, though, we need to find a house. That’s been the crux of the problem. It is definitely a seller’s market here in Rhode Island. So many buyers and not enough inventory. As a realtor and a consumer, I’m seeing it first hand. Homes are selling quickly if they are priced right and have the right bones. That’s all we need – good bones… at the right price, of course! We started a very general search back in January knowing that the real search wouldn’t need to start until March or April. We just wanted to see what was out there and get in a few houses. One day we stumbled upon an open house, and I actually fell in love with it. It wasn’t what we were looking for at first, but it felt good, and we knew we could be comfortable in it for a long time. It took us 24 hours to decide that we wanted to put in an offer. Most of our hesitation was that it was way too early. Our lease isn’t up until July 1st, and the sellers of this house could have closed very quickly. We crunched the numbers and determined that it was still worth a shot. Sadly, we were just 12 hours too late. Another offer had already been submitted and accepted. Womp Womp. Since then I’ve had a hard time getting that house out of my head. It had a lot of space, and was in a good neighborhood. The curb appeal was good, and the price was right. And since then… Zip. Nada. Nothing! Ok, that’s not fair. There is stuff on the market – even in our price range. But it’s either in the wrong location or too small or too ugly (with no hope of salvation!) So we’re just waiting. Impatiently I might add. We’re ready to put down roots. We’re ready to be out of our rental. We’re ready to start making friends. We’re ready to renovate and decorate. We’re just ready. Owning a house is like a hobby to us. An expensive one, but a hobby nonetheless! We have hope that April will bring more homes on the market. Considering the area we’re looking in is one of the top two school districts in the state, most people are probably waiting until closer to the end of the school year to put their home on the market. At least that is what I am hoping for. Until then, we’ll keep trolling open houses, keeping our eye on some of the not-so-great ones (that could be great for the right price! ), and trying to be patient. The house hunt continues…. Do you remember the song, “Make new friends, but keep the old. One is silver and the other gold.” I love that song. It rings so true, especially since we’ve moved far away from our wonderful friends in Maryland and Virginia. We’re in a tough spot right now because we’re planning to move to a new town this summer. We knew that we would not stay in our rental for more than a year, so we didn’t really make a lot of effort in terms of friends. We have some great rear neighbors, an old high school friend of Jeremy’s and his family, and Mason has made a good couple of friends at school, but that’s about it. We have our colleagues, but we’re not quite to the point of them being “friends” yet if that makes sense. We’re not doing anything outside of work with them yet. (Yet being a key word there because I hope we get to that level in the near future!) Friendships take time and effort, right? I have a lot of hope for making friends in our new town. When we’ve bought a house, and I know we’re settled for a while, I will definitely make the effort and put in the time to make new friends. Until then, though, I’m relying on my golden oldies! (And will continue to even when I have new friends!) Especially since this past week has been a rough one up here in L’il Rhody. It could be the weather or just the time of year or a low week in general, but I’ve been feeling lonely. I’ve kept up with many of our friends after our move – with email, texts and phone calls – but it doesn’t replace the time spent together. That’s what I’ve really been craving – time with my friends. 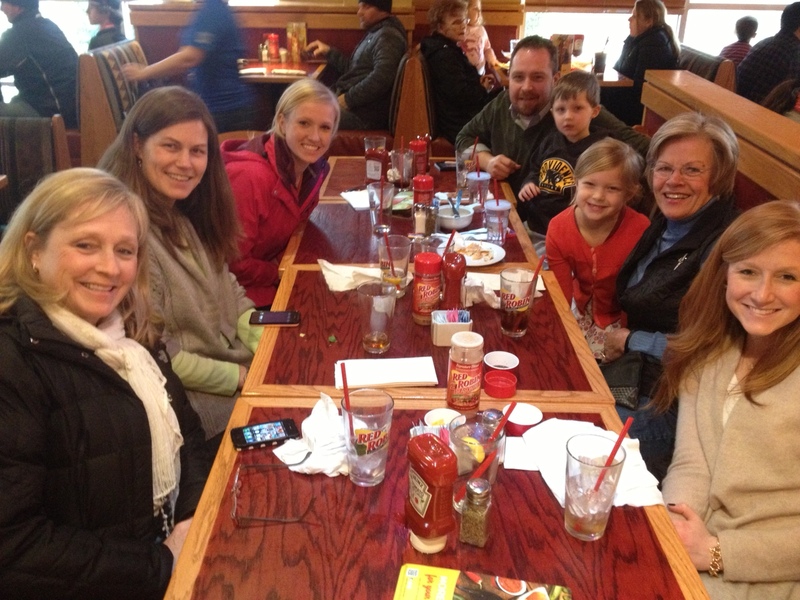 Lunch and laughter at Red Robin! After another successful healthy meal tonight, I am beyond thrilled with my family’s new “health kick.” Jeremy and I have been focusing on healthy eating and healthy living, and it’s working! The kids are even enjoying the meals I’m cooking – that’s gotta mean something good is happening, right? The big challenge this week is to have a meatless night. Inspired by my best friend, Megan, at Nosey by Nature, we’re trying to go meatless one night a week. I still have no idea what I’ll be cooking for my first venture into vegetarianism, but I’m leaning towards this Quinoa Veggie “Fried Rice.” I’ll let you know how it turns out. And if you have any other meatless meal ideas for me, please let me know. I have a feeling I’ll run out of ideas pretty quickly based on my family’s likes and dislikes. The key is that I’m trying. We’re all trying. Cooper has even told us on a few occasions how he wants to eat healthy. He’ll decline something random saying he wants to be healthy. Or he’ll ask if what he is eating is healthy. I’m not sure if he is getting this from us or from school, but he is very focused on it right now. I love it. He’s always been our veggie and fruit eater, though, so it’s not a huge change for him. At the store the other day, he actually picked out a gluten-free organic version of what I can only describe as “frosted flakes.” While we usually don’t allow any sugar cereals in the house (other than on vacation or at Christmas), I took a look at the ingredients and compared them to our usual Quaker Oatmeal Squares and was pleasantly surprised. The flakes were “better” for us with more natural ingredients. I bought them and have actually really enjoyed them this week as a snack or with milk in the morning. Now don’t go thinking that we’re going gluten-free over here! I can’t take it that far. I love me some gluten! But it’s a decent cereal that just happens to be gluten-free. It might just open up our minds to other gluten-free possibilities. When it comes down to it, our health kick is really a lifestyle change. The more we do it, the more we commit to it, the more natural it will become. Then it won’t even be a health kick anymore – it will just be life…. the way it should be.